When fitting the 02M into one of the above, the mounting cup on the subframe will have to be re-positioned otherwise the gearbox output flange will fail against the mounting cup. This mount takes that into consideration and will give you the new position the cup needs to be welded back in to. Also included in this kit is a front support mount, this mount locates around the starter motor and then bolts to the original MK2/3 front mount. 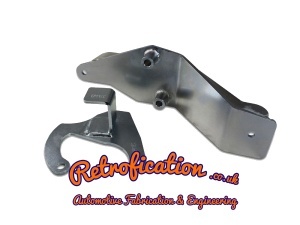 The allows the original front mount to be used without modification or welding.